Poachers Decimate Tanzania's Elephant Herds Tanzania has one of the largest elephant populations in the world. It also has one of the biggest poaching problems. An estimated 10,000 elephants a year are being slaughtered for their tusks, many of which are shipped to Asia. Tanzania has been identified as the leading exporter of illegal ivory in recent years. An estimated 10,000 elephants are being slaughtered in the country annually. Here, elephants walk in the Serengeti National Reserve in northern Tanzania in 2010. Conrad wrote more than a century ago, when there were no laws against shooting elephants. If anything, today's restrictions on the ivory trade have only increased its value. The slaughter of elephants and the seizure of illegal ivory have soared to their highest levels in decades. A voracious market in Asia and chaotic wildlife protection in much of Africa have put elephant herds at risk throughout the African continent, particularly in Central and East Africa. Poachers are gunning down whole families, oblivious to game scouts. A key battleground is Tanzania, one of the world's last great repositories of elephants. Perhaps 70,000 to 80,000 elephants roam this nation's immense sanctuaries, amounting to perhaps a quarter of all African elephants. In colonial times, the Tanzanian island of Zanzibar held the largest ivory auctions in the world. Today Tanzania has regained that infamy. Those public auctions have been replaced by underground networks of smugglers, but Tanzania remains a leading source of ivory. From 2009 to 2011, the country was the leading exporter of illegal ivory in the world. Thirty-seven percent of all elephant tusks seized by law enforcement came from Tanzania, with neighboring Kenya a close second. On Saturday, customs officials in Hong Kong announced the seizure of nearly 4 tons' worth of ivory hidden in two containers shipped from Indian Ocean ports in Tanzania and Kenya. Whether the ivory is merely transshipped through Tanzanian ports or plundered from its parks is a point of contention. Conservationists say Tanzania has for years been one of Africa's worst elephant slaughterhouses. They blame authorities who are unable or unwilling to control poaching and trafficking. The government acknowledges there is a problem and says reforms are under way. "There's an enormous slaughter of elephants going on in Tanzania right now. Things are out of hand," says Iain Douglas-Hamilton, who has been studying and protecting elephants in Africa for 47 years. "There's no protection in numbers for elephants any more than there was for bison in the last century when they were all wiped out in America. So people shouldn't kid themselves." 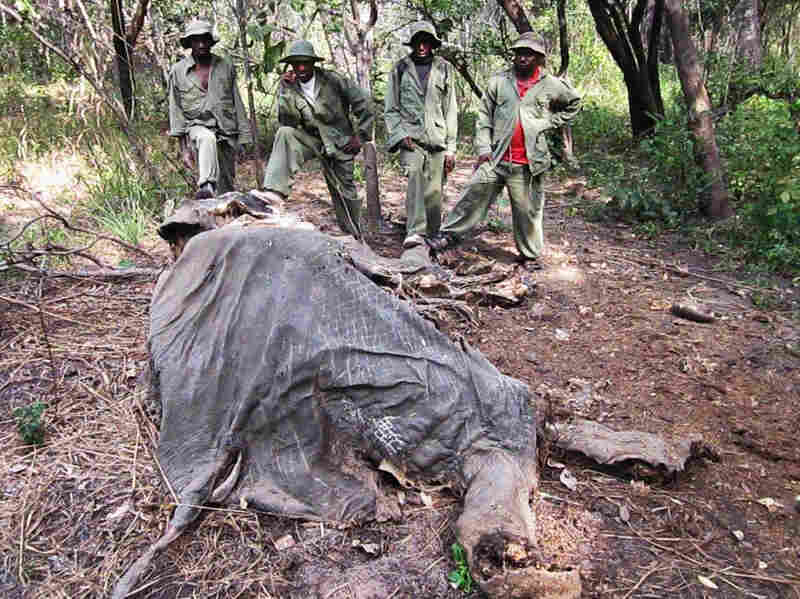 Wildlife rangers in Tanzania came across this elephant that had been killed for its ivory. Tanzania says it wants to prevent the slaughter of elephants, but rangers are poorly paid and are responsible for monitoring vast game reserves in the East African country. Tanzania had been curiously mute over the massacre of its elephants. But recently, an avuncular, white-haired member of Parliament offered this grim assessment. "Thirty elephants per day. At the end of the year, you're talking about 10,000 elephants killed," says James Lembeli, chairman of Parliament's Natural Resources Committee and a former National Parks official. "Move around this country where you have populations of elephants: carcasses everywhere." I decided to go see for myself. Two Masai tribesmen in tire-tread sandals use elaborate whistling to herd their cattle. They know this landscape of dry thorn brush and tawny grass intimately. So they lead us to a recent elephant kill on the Tanzania-Kenya border. We walked up on the carcass of a dead elephant. It was killed sometime last month. All that's left is a great leathery hide, gray on the outside, pink on the inside, decomposing on the savanna. The poachers hauled off the tusks. The villagers came and cut away all the meat, and took the head and bones. The scene is being repeated again and again across Tanzania. The poachers come in all types in Africa these days. The Democratic Republic of Congo recently accused Ugandan soldiers of machine-gunning elephants from a military helicopter. Some poachers track jumbo elephants on foot for days like big-game hunters. Others use high-tech shortcuts. Robert Waltenburg manages Lake Chala Safari Camp, a small, private game reserve where we found the carcass. It's one of eight elephants killed here in recent weeks. Waltenburg believes his clients unintentionally guide poachers to their targets by posting photos of elephants with big tusks on social media, which are monitored by resourceful poachers. "It's so easy to research on the Internet, just type in 'elephant sightings' in this region. Things will pop up," Waltenburg says. There's an enormous slaughter of elephants going on in Tanzania right now. Things are out of hand. There's no protection in numbers for elephants any more than there was for bison in last century when they were all wiped out in America. Reliable numbers of killed elephants are hard to come by. According to the MIKE program — Monitoring the Illegal Killing of Elephants — poachers are responsible for 60 to 90 percent of elephant deaths in Tanzanian wildlife reserves. National parks like the Serengeti are better protected. Like other African countries, Tanzania is losing its elephants to poverty, poor administration and corruption. First, a pair of big tusks is a year's income to a subsistence peasant. Second, wildlife rangers are ill-paid, and punishment for a convicted poacher can be as little as a $13 fine. Third, individuals inside the Tanzania Ministry of Natural Resources and Tourism have been selling out the nation's heritage that they were supposed to protect. In the past few months, the minister and top officials in the Wildlife Department were sacked for their roles in two scandals: taking bribes for the assignments of hunting blocs and allowing 116 live wild animals to be loaded onto a jumbo jet and smuggled out of the country to Qatar. The new minister, a former diplomat named Khamis Kagasheki, gets high marks from wildlife advocates. In his office in Dar es Salaam, Kagasheki is asked whether people in this building helped the poachers. "You know," he says with a deep sigh, "there has been, of course, there's been corruption." His concern is echoed by an outspoken tour operator, Pratick Patel. "I think a lot more firing needs to be done. We know for a fact, the whole industry knows for a fact, that a lot of the wildlife department are involved, very much involved in poaching in the game reserves," Patel says. "Unfortunately, the Wildlife Department has, to some extent, been operating like an independent company." Kagasheki admires his northern neighbor, Kenya, where anti-poaching laws and the Wildlife Service are much tougher on elephant killers. Kagasheki says he is trying to turn around the culture of the ministry he took over five months ago. "What I'm saying is we have to be stringent. We have absolutely no choice. These people are killing innocent animals with impunity. And when you look at these elephants, beautiful beasts," he says. Conservationists are dubious of Tanzania's commitment to elephants. 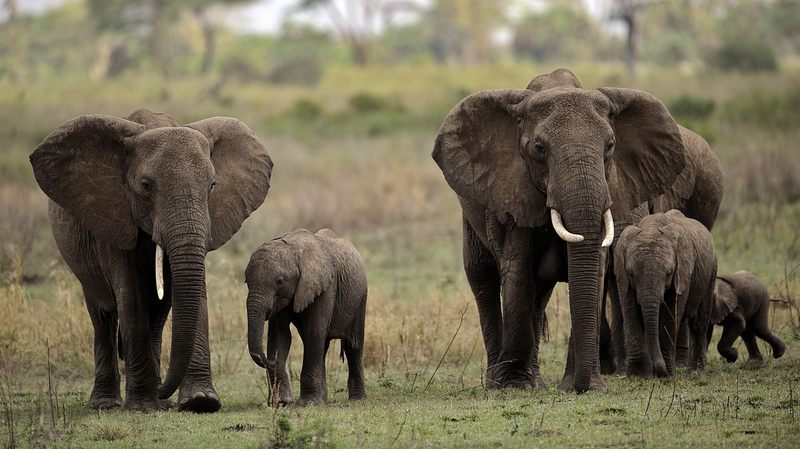 This month, Tanzania notified the Convention on International Trade in Endangered Species that the country would like to sell off its 100-ton stockpile of confiscated ivory and downgrade the protection of elephants. The government says a one-off ivory sale will raise millions for wildlife protection. Conservationists say ivory sales just fuel the slaughter of more elephants.